Paw Print Genetics - My Dog’s Mouth Has Been Bleeding? What Could Be Wrong? In my years as an undergraduate college student, struggling to make ends meet, I lived next door to a woman with an old, Labrador mix named Bubba. By initial impression, he seemed to be a very normal, happy and well-socialized dog. However, one day, during my daily greeting from Bubba, I noticed some blood around his mouth. At the time, I was a biology major trying to wade through prerequisites for admission to veterinary school and I hadn’t yet been exposed to the world of clinical veterinary medicine. So, when I saw the blood around Bubba’s mouth, I didn’t pay much attention. I had seen blood in my own dog’s mouth on occasion after chewing on a toy or a bone and it never amounted to much. So, my uninformed mind had little to worry itself about. I later learned from Bubba’s owner that he had bled like this since he was young. However, the owner had never taken Bubba to a veterinarian for a diagnosis and to this day I still don’t know what was wrong with him. Though the memory of Bubba had faded quite a bit over the years when I was presented with a very similar case in practice some 7 years later, the memory of Bubba and my curiosity to find out what could have been causing his problem came rushing back. A sweet, elderly gentleman brought in his young, sexually intact Beagle one morning with the complaint of frequent bleeding from the mouth and "a couple" of episodes of nose bleeding. Upon further questioning it was determined that his dog would bleed from the mouth (actually dripping blood from the mouth at times) when chewing on rawhides and that he had his nosebleeds after rough housing with the other family dog. After getting all of the important clinical information and performing a physical exam, the dog appeared healthy and it was time to make my list of potential rule outs for diagnostic testing. Dogs can bleed excessively for a variety of reasons. Many are acquired diseases that arise later in life, but others are genetic diseases that dogs are born with and usually identified at a young age. Given that this Beagle was a young dog, I was suspicious of inherited disease, but had to rule out the acquired causes first. Some potential rule outs of an acquired bleeding disorder include liver failure, autoimmune disease, cancer, vitamin deficiencies, severe infection and exposure to rat poisons. After further questioning and an initial round of blood work, it was determined that these causes were unlikely. It was at this point that I began to investigate inherited bleeding disorders of dogs. Bleeding disorders can be grouped into two categories; diseases of aggregation and diseases of coagulation. Aggregation (or primary hemostasis) is the initial accumulation of platelets in a wound in order to form the platelet plug that begins the clotting process. Diseases of aggregation usually involve abnormal changes to platelets or the proteins that they adhere to when forming the platelet plug. Coagulation (or secondary hemostasis) is a complex series of interactions between proteins called coagulation factors that strengthen the original platelet plug to form a solid clot and stop hemorrhage. Diseases of coagulation usually involve abnormal changes to the coagulation factor proteins or other proteins involved in the “coagulation cascade” that occurs upon injury. 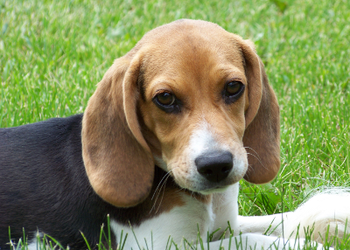 After studying potential causes of inherited bleeding in a Beagle, multiple genetic tests were ordered. It was determined that he was suffering from Factor VII Deficiency, a disease of coagulation that results in relatively mild disease often causing frequent bruising and nosebleeds. It is often discovered at an early age during a spay or neuter procedure. However, the owner in this case had not yet sterilized his dog, so the disorder was not yet identified. Upon diagnosis, the owner was educated about the disease, acute bleeding management, and how to look for signs of major internal bleeding (pale gums, black stool). I saw the Beagle on a couple more occasions during the next year. Though he continued to bleed on occasion, there were no serious issues and he seemed to be a happy dog. Unfortunately, there are not adequate daily treatments available for dogs with inherited bleeding disorders, thus making genetic testing of the dam and sire prior to breeding particularly important in order to prevent passing on disease to offspring. If performing surgery, certain disorders can be treated preventatively with the drug desmopressin or an infusion of cryoprecipitate. In more severe bleeding episodes, blood transfusions may be the best option. Though I’ll never know why Bubba bled the way he did, and though I couldn’t do much to help the young Beagle, these two experiences formed the foundation of my clinical experience and knowledge about bleeding disorders of dogs. Luckily for Bubba and the Beagle, these issues still allow them to live relatively normal lives despite occasional bleeding episodes. Unfortunately, some of the diseases (Hemophilia and Von Willebrands Disease Type III) do not allow for normal activities and can greatly decrease quality of life. Paw Print Genetics currently offers the following tests for diseases of aggregation: Glanzmann’s thrombasthenia (Great Pyrenees and Otterhound), May-Hegglin Anomaly (Pug), Von Willebrand Disease Type III (Kooikerhondje), Leukocyte Adhesion Deficiency Type III (German Shepherd Dog), P2RY12 Receptor Platelet Disorder (Greater Swiss Mountain Dog), Prekallikrein Deficiency (Shih Tzu). Paw Print Genetics currently offers tests for the coagulation diseases Hemophilia A and B (German Shepherd Dog, Beagle, Cairn Terrier, and Rhodesian Ridgeback) and Factor VII Deficiency (Airedale Terrier, Alaskan Klee Kai, Beagle, Giant Schnauzer, and Scottish Deerhound).